The man most days is helpless, but he is my helpless dad. One of the things we love doing is watching TV shows together. Right now we are addicted to The Big Bang Theory and The Goldbergs. We watched every Friends episode together and every Office episode together as well. We are always looking for new shows and we just found a new one to watch together! Richard Dean Anderson (TV's MacGyver) steps into the irresistible and charming role of Ernest Pratt, a dime-store novelist who is living out the adventures of his fictional character Nicodemus Legend in the Old West. Co-starring John de Lancie (TV's Star Trek: The Next Generation) as Janos Bartok a brilliant scientist, the duo teams up to fight for justice using Legend's celebrity and Bartok's outlandish inventions to make a real legend. Created by Michael Piller (TV's Star Trek: Deep Space Nine, Star Trek: Voyager) and set in the late 19th century, LEGEND combines historic characters, setting, and special effects for a lighthearted, fun, and action-packed series that is part western and part science fiction. Enjoy all 12 original episodes available for the first time on DVD! So even though the series wasn't long it was still so much fun! It combines both comedy and an old west feel to make it an instant classic! I was so bummed to realize there was only 12 episodes! I wanted more. 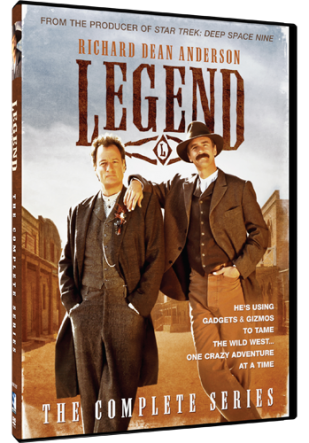 Legend The Complete Series is just one of the many shows offered by Mill Creek Entertainment! They have so many shows both old and new.